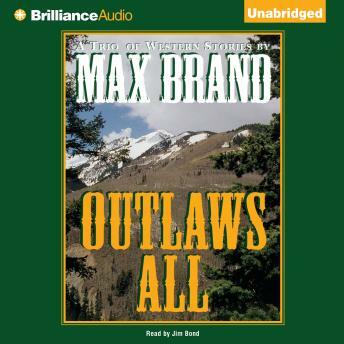 Max Brand is the name by which American author Frederick Faust is best known and loved. His fiction has been proclaimed vital reading for the development of the short story in American literature. Three of his stories appear together in audiobook form: ALEC THE GREAT Set in Alaska during the gold rush days of the 1890s, the background of the bitter enmity that destroyed the once great friendship between Hugh Massey and Arnie Calmot is explained. (The events preceding the clash of these two titans for possession of a most extraordinary and powerful dog are told by young Joe May in Sixteen in Nome.) RIDING INTO PERIL Kantwell Irving Dangerfield, commonly known as the Kid, is thrown in jail on a spurious charge. He makes good his escape and embarks on a life of dangerous adventure. He meets the enchanting Marianne Justis when he is hired to track down a mysterious renegade known as The Phantom. But even should he succeed in his battle with The Phantom, he will still be left outlawed, a wanted man. OUTLAWS ALL Listen to the enlightening story unfold of Bull Hunter, a gentle giant of a man who sees so deeply into the human soul, encountering and befriending a mighty wolf dog known as The Ghost.